Start-up company says rodents are better than dogs in sniffing explosives, require 10 days' basic training. Lab mouse: an anti-terror soldier? An Israeli start-up uses mice to sniff out explosives at security checkpoints. The company, named BioExplorers, is staffed by IDF Special Forces reservist soldiers and biologists. They say that mice have a keener sense of smell than dogs, and can be trained to identify the odor of explosive material as an unpleasant one. "Bio Explorers systems are based on combining the hyper- sensitive olfactory capability of rodents with the care-free reliability of a hi-tech machine system," the firm explains on its website. "Many millions of years of evolution made the olfactory system of rodents incredibly sensitive, quick and specific as this is their main sense used for foraging, mating and avoiding predators." The system does not involve any physical contact between the mice and the people being screened. As the embedded promotional video shows, the mice are completely invisible to the people being checked. The "Biosensors," as the trained mice are called, are housed inside "cassette enclosures," each holding 4-8 mice supplied with all their needs. The warrior rodents' basic training takes about 10 days. In this time they are trained to identify a specific odor as unpleasant, and react to it by moving into a different compartment, away from the smell. Training for recognition of additional odors take a few days each. "Rodents are known to remember dozens of different odors and differentiate them from thousands of other odors," the website explains. "Each of the 4-8 rodents in the system will be trained to react to all the relevant odors." Biosensors claims that skepticism over the reliability of mice is not justified, noting that sniffer dogs are currently considered the most reliable means of detecting explosives. Checking a person or item with mice takes 3-6 seconds, while a check using dogs takes at least a minute. The firm claims it conducted a successful experiment in a Tel Aviv shopping center in December 2009, in which 22 explosive charges were planted on people entering the mall, or in objects they carried. All 22 charges were identified by the mice. The mice live for 2-3 years and can work for about 18 months. They require short refresher courses in explosive-sniffing every month or so. "We are developing an automatic maintenance system that will minimize manual procedures. We expect to reach a standard where you will have a daily calibration, bi-weekly cartridge replacement of food, water and bedding, and monthly training refreshment," the company explains. 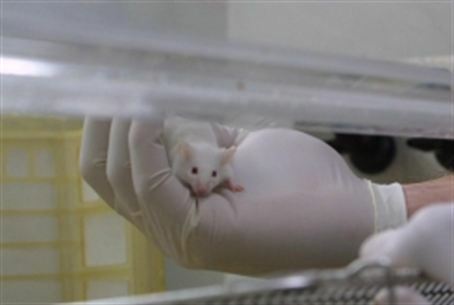 To soothe hygiene-related concerns, the firm's website assures potential clients that the mice are born and raised in laboratory conditions, and their health is monitored periodically by a veterinarian. News of the counter-terrorist mice could have a disturbing effect on Arab populations that are already concerned that Israel may be using vultures and sharks for security purposes. In 2008, Palestinian Authority newspapers claimed that Israel was using rats with supernatural abilities to chase Arabs out of Jerusalem.